We developed a preliminary computer model and gave some thought to a proposal. While many details need attention, the basic plan is for two digesters lying side-by-side along with gas storage within the 40’ container. Bill Talvitie, the gentleman who helped with computer modeling of the Glenside Elementary greenhouse-digester project, was quite anxious to be of assistance in post-earthquake Haiti. 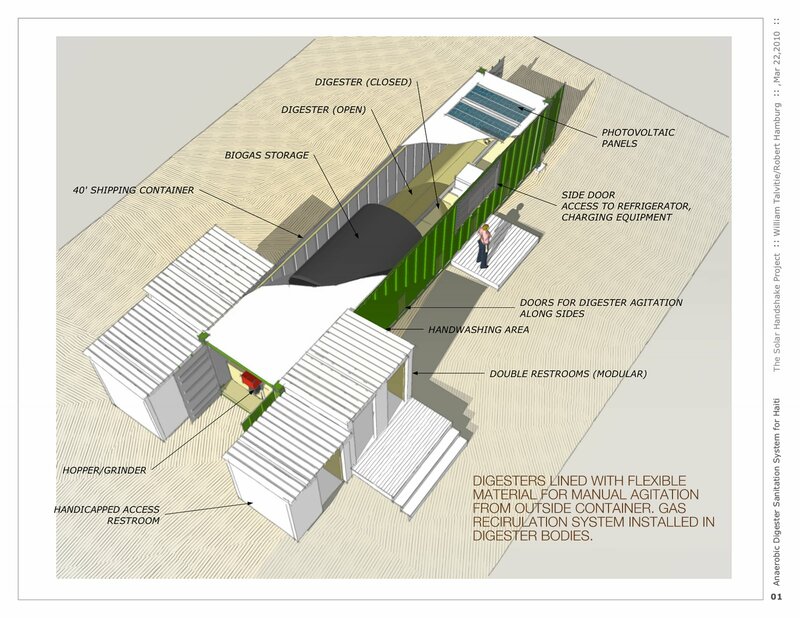 His experience with shipping containers led us to begin developing plans for a container-enclosed, movable, but earthquake and hurricane-resistant, digestion-based sanitation system. I greatly appreciate the irony of using the waste containers from failed material globalization as modules for local community development. We developed a preliminary computer model and gave some thought to a proposal. While many details need attention, the basic plan is for two digesters lying side-by-side along with gas storage within the 40’ container. Four restroom toilets feed directly into the digesters, while two handicapped restroom toilets will require emptying. A biogas-powered refrigerator/freezer is included for medicines. Solar panels – secured to the roof — are included for small system air and water pumps, a community charging station for cell phones and the like, LED lighting, et al. Except for a couple biogas outlets and electric plugs, all gas piping and electrical wiring is kept secure within the container. So “What will it cost?” I can’t say precisely because the prototype has not been built. Nevertheless, I can suggest some figures. If the actual total system were to cost as much as $30,000 and serve only 200 people (low), it would cost $150 each to begin. Over a 10-year lifetime (very low), that would be $15/person/year – for sanitation services and fertilizer and humus supply only. But the total system also includes biogas supply for several households, the biogas-powered refrigerator/freezer for medicines, and the photovoltaic system for electricity for lighting and electronics charging. All of these benefits are included in the above mentioned cost. The system would likely require the part-time attention of two people for maintenance. Ideally, this container system would provide one side of a community garden to facilitate use of the fertilizers. Other infrastructure-providing containers, such as a nurse’s station, could form other sides. Given the long years that increasing numbers of refugees are forced to live in camps, these systems would certainly have broad applicability.